A game which is told to have been born in India and brought via Tang Dynasty. The original pronunciation was Suguroku. Dice holder in the center of the game board, arrange 15 pieces each of black and white in a block of 12 partition in the right and left, cast 2 dices from a cylinder, make move according to the number, win when all pieces have moved in the other's side. The size of the board was not unified, and there were many variances in its rule, the number of pieces and the arrangements. In the Nihon-shoki [Jitou 3rd] reads "prohibit and cease Sugoroku on the day of tsuchi-no-tori-no-hinoe-tatsu in December" because it was played for gambling. There are 2 poems in Man-you-shu, the first one is read "one-two, five-six-three, four" by a theory. The next one is such a nonsense as sings, a swelling on a big saddle of Sugoroku growing up on the forehead of my wife. It was played in Heian era too. In Makura-no-soushi reads "Go, Sugoroku and tales" in the 140th chapter, things to do for passing time aimlessly, a scene is also written in the chapter Wakana Ge of Genji-monogatari (the tale of Genji) where the princess Oumi plays Sugoroku. 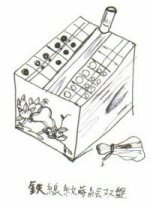 Although it had been played through the Medieval Age, Sugoroku became out of vogue in Edo era, disappeared in Bunka-bunsei period [1804-1829] and has been replaced by Paper Sugoroku. It began with "Buddhist Sugoroku" preaching Buddhist doctrines at first, then changed into "Pure Land Sugoroku", and into "Touring Sugoroku". It became kid's game since Meiji era. The Paper Sugoroku is made with a large paper partitioned in several blocks with pictures each, played with a dice making pieces forward according to the number from its start block, won by arriving goal faster than other players. There are not many poems in old days composing Sugoroku in. A verse named "Sugoroku-ban-no-uta" in "Minamoto-no Shitagou-shu" reads "su-ku-ro-ku-i-chi-ba" word played with the first and last syllable. The reason why Ozawa Roan picked 15 poems is supposed to be the number of blocks on the board. Should "Suguroku-ichiba (market)" imply a situation of gathering of pieces like a market where cloud of people are gathering? A Haiku composed by Tatebe Souchou in his collection "Sobakari" [issued in 1870] To see all scenery in Sugoroku, Udsu mountainsis composing a touring Sugoroku. Kyoshi also composed one in his "550 Haikus" [issued 1943] Calm and beautiful after being lost in SugorokuThe seasonal word is the New Year. There are hardly found in contemporary Tankas or Haikus.